In large bowl, stir cookie base ingredients until soft dough forms. Spread dough in bottom of pan. Bake 20 to 23 minutes or until golden brown. Cool completely, about 30 minutes. Spread raspberry jam over cooled base. In large bowl, beat cream cheese and lemon curd with electric mixer on medium speed until smooth. Fold in whipped topping. Drop lemon mixture by teaspoonfuls over jam layer; spread gently and evenly over jam. Sprinkle toasted almonds over top. Refrigerate at least 4 hours or overnight. For bars, cut into 6 rows by 4 rows. 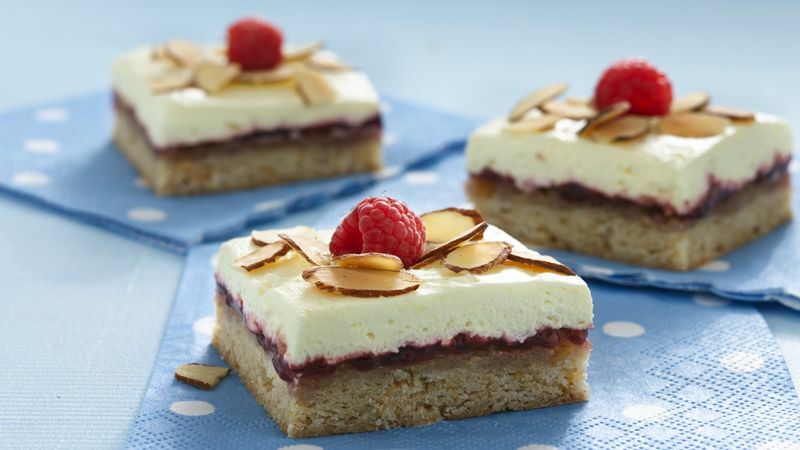 To serve, top each bar with 1 raspberry, gently pressing into lemon mixture. Store covered in refrigerator. Find lemon curd next to the jams and jellies in your supermarket. Cut bars into larger dessert-sized servings and serve with a fork. To toast almonds, bake in ungreased shallow pan in 350°F oven about 10 minutes, stirring occasionally, until golden brown.